Blue Cares would like to thank a very special donor who contributed over an estimated $4,000 in toys this Christmas. The Loga Fishing Team decided to assist the Blue Santa program this year all thanks to founder Jerman “JJ” Sanchez. Loga Fishing Team, in partnership with the San Antonio Marriott Rivercenter, collaborated to achievehigh goals for a great cause. The Loga Fishing Team and family agreed to support in the Blue Santa toy drive without hesitation. With intricate planning and an outpouring of support from the fishing community, the Loga Fishing family was able to collect over an estimated $4,000 in toys. A toy drive was held on Dec. 2, 2018 and people who live all around Bexar County and the surrounding counties made the trip to Outdoor Alphas to drop off their donations. Samuel Garza and wife Norma Garza, owners and operators of Outdoor Alphas, graciously offered their place of business to host the toy drive and donated food and drinks to everyone who went by to support. Several businesses came together and also donated their products or services in exchange for toys or cash for toys. Generous small businesses and non-profit organizations such Outdoor Alphas Rods and Reels, Bullred Leaders, Fin Addict, Good Times Fishing Guide, AAA-1 Commercial Truck Tire Service, Photography by Roger Lopez, and DJ Jaimito contributed their time and support to this great cause. 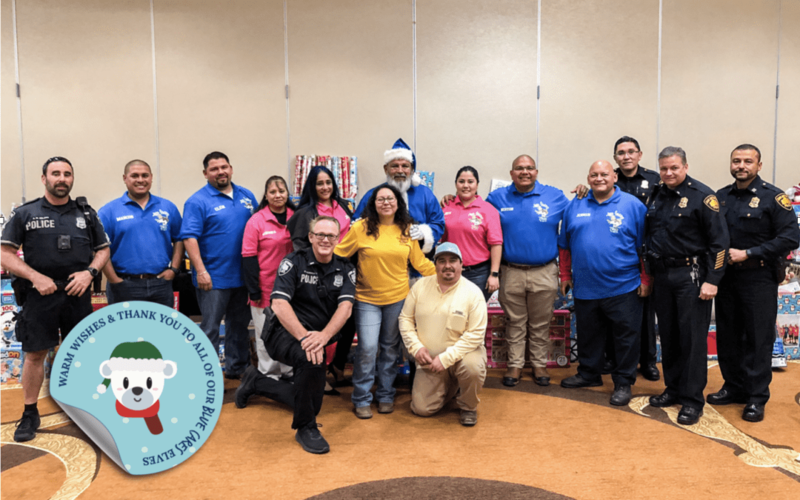 Mrs. Becky Vasquez held her own personal toy drives with her friends and family and was able to collect several large bags filled with toys to donate. Loga Fishing Team members sold some of their beloved fishing rods and reels to help generate funds to purchase more toys. Captain Nestor Lopez with Loga Fishing Team also offered fully guided fishing trips at Calaveras Lake and Brauniq Lake for the cost of $40 cash to buy toys or $40 worth of toys. These trips generated another several large bags filled with toys. The Loga Fishing Family stayed motivated by reminding everyone involved that “one toy equals one smile” for the children of the community. Blue Cares would like to thank the Loga Fishing Team for their generosity and being one of our biggest donors of Blue Santa 2018!